Of the five hallowed Siva temples (pancha ishwarams) in Srilanka Naguleswaram once stood supreme in the Jaffna peninsula. Hindu shrines attain a unique status when blessed with three special attributes moorthy (deity), thalam (temple and its precincts) and theertham (source of water). Endowed with all three, Naguleswaram has been regarded from ancient times a pre-eminent place of worship. Popularly called Keerimalai (nagulam – keeri – mongoose), the place has its name wonderfully preserved in numerous legends. Previously it had been called Tiruthambaleswaram. The curative value of its waters is the theme around which many legends have emanated. Ancient texts refer to the confluence of fresh water from the springs on the coast, with brackish water from the sea, ganga samudra sangamam, as the union of the powers of Siva and Sakthi. The sage Nagulamuni found a cave nearby a haven for meditating and “faced the rising and setting suns with equal facility and had the summer and winter solstices directly overhead, when they occurred” (Dr.R.Vigneswaran in Naguleswaram, 2003). In his treatise, Tamil Culture in Ceylon (1950), MD Raghavan refers to the “sacred spring of Keerimalai –its very name signifies the hill of Nagula muni, the sage who was shrunken with austerities, that was likened to the Kiri (mongoose)”. Maruthapuraveehavalli, a Pandiyan princess, cured of her equine facial features by the waters, built Maviddapuram Kandaswamy temple nearby. The late Dr.Arumugam, an Irrigation engineer by background and Hindu scholar, in his book More Hindu Temples in Srilanka, quotes scientific evidence relating to the mineral content of the waters of Keerimalai and that being the likely reason for the curative properties. There are numerous puranic references to the historic temple, notably in Dhakshina Kailaya puranam. Suta Samhita, a Sanskrit work on Saivaism and part of Skanda Purana, refers to Naguleswaram among ancient sites of pilgrimage, an indication of the antiquity of Saivaism in Jaffna. (A Short History of Hinduism in Ceylon, CS Navaratnam 1964). There are also stories from the epics Mahabaratha and Ramayana which relate to this ancient temple. The Yalpana Vaipava Maalai, credits Prince Vijaya as the one who restored the Siva temple. However the historian and Cambridge scholar, Paul Pieris asserts, “ Long before the arrival of Prince Vijaya, there were in Srilanka five recognised Iswarams of Siva which claimed and received the adoration of all India. These were Tiruketheeswaram near Mahtitha; Munneswaram dominating Salwatte and the pearl fishery; Tondeswaram near Mantota; Tirukoneswaram near the great bay of Kottiyar and Naguleswaram near Kankesanturai. The situation of the shrines close to these ports cannot be the result of accident or caprice and was probably determined by the concourse of a wealthy mercantile population whose religious wants called for attention…”. The impressive Hindu temple on the northern coast did not escape the envy of Portuguese invaders in the early 17th century. In 1621 Naguleswaram was razed to the ground by marauding forces. Yalpana Vaipava Malai refers to a Brahmin priest fleeing the temple but ensuring that at least some of the valuables were preserved, by hiding them in a near by well. It was not any easier under subsequent rulers. In 1878, the savant Sri Arumuga Navalar who led the revival of public interest in Saivaism, campaigned for the restoration of the temple, urging every one to donate in kind or cash for this work. Seventeen years later a consecration ceremony took place. However in 1918 the temple suffered severe damage due to an accidental fire. On the 18th of October 1990, while the auspicious Kedara Gowri fast was being observed in the temple by hundreds of devotees, the Srilankan forces carried out an indiscriminate aerial attack. This resulted in extensive damage to the temple buildings and priest’s quarters. The chief priest and members of the public had to flee for safety. The area was completely out of bounds for seven years. In 1997 the chief priest who was allowed to visit the area with the Additional GA and others discovered the extent of the sacrilege (Case of the missing idols – vandalism or sacrilege? -Weekend Express May 10th 1997). The reparations so far by successive Governments have been far from adequate. The new moon or amavasai is a significant day in any calendar. 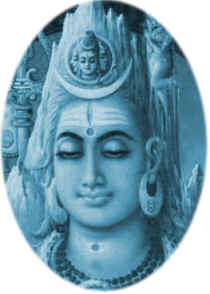 According to Hindu astrologers, in the month of Aadi, the moon is in the ascendant in Kataka rasi, which is occupied by Sun, and this concurrence is reminiscent of Siva and Sakthi. Hence the special significance of Aadi Amavaasai as a day when children remember their departed parents, notably their late father. It is customary for them to perform ablutions, offer prayers to the departed souls with the help of a priest (dharpanam) and attend a temple of Siva. In Srilanka, Keerimalai continues as the foremost shrine for Aadi amavaasai. 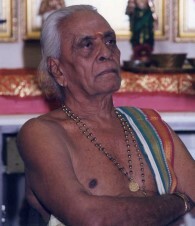 The present Chief Priest Sri Naguleswara Kurrukkal took over the mantle when only 22 years of age, after the passing away of his father in 1947. Hence, for an unbroken period of nearly six decades he has carried out this function with great dedication and devotion. Many of his children are abroad as leading priests in their respective countries, returning home to help their father during important festivals. Sri Naguleswara Kurrukal himself has visited the UK five times, the last one following an invitation to officiate in the consecration ceremony of the London Murugan Temple. He has been afforded this honour in several other countries including India, Australia and South Africa. Instead of choosing a comfortable existence in an affluent abode, he toils with singularity of purpose for the restoration of Naguleswaram. Despite the trying circumstances under which he works, he has slowly but surely rebuilt the temple with donations received, to an extent where nearly 70% of the work is complete. The political situation permitting a Maha Kumabhishekam is being mooted within a couple of years. A pre-requisite for this is a raja gopuram or temple tower.